The most important piece of equipment to think about before getting on the water in your new kayak should always be a PFD (Personal Flotation Device) or Lifejacket. 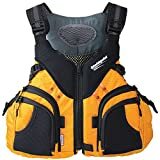 The main difference between the two is that a Life jacket typically provides more floatation but positioned around the neck and across the chest so the user will be flipped onto their back. Keeping the airway clear. This is ideal for small children and for use in big seas. Also for non swimmers, it can sometimes be a good idea. 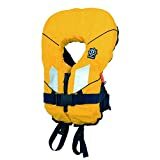 Life jackets can be foam filled or gas powered to provide the necessary lift. The PFD (Personal Flotation Device) is designed with foam buoyancy both front and rear so in the event of a capsize the user will bob like a cork making it much easier to swim and climb back aboard their craft. The downside being that if the user is unconscious then the PFD will not prevent them from staying face down as a life jacket would. For the majority of our usage, in a kayak, a PFD is a better, more simple option, with a range of extras and sizes available. A buoyancy aid must be both comfortable and carry the correct amount of Buoyancy. All of the Buoyancy aids reviewed here carry the US Coast Guard accreditation meaning they have passed the tests and regulations set by the US Coast Guard committee in respect of designing and fabricating a good quality product which meets their levels of safety and security. 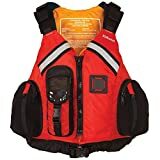 The Chinook PFD from NRS is one of my favourites a comfortable, attractive vest style PFD with lots of pockets. The Chinook is a popular high back design. Allowing you to sit comfortably on your kayaks seat, using the backrest, without the extra foam bulk pushing you away. The Chinook is available in three colours to suit your own style and adventures. The array of pockets are well positioned so not to prove bulky or inhibitive. With good organisation and space, the chinook makes the perfect PFD for kayak fishing or touring. This feature-rich PFD is soft and comfortable to wear allowing you a lot of movement to raft, kayak or Sup. 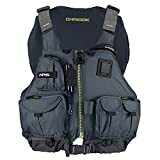 NRS Chinook Mesh Back Fishing PFD has seven front pockets which can store different items include tackle boxes and tipper. This storage ability is supported by 8 customizable attachment points, such as a coil tool retractor, D-ring and attachment loops, rod holder loops, and a knife lash tab. It’s easily adjustable with the front opening easy to fit over other garments. A favourite of mine the Highback PFD from Yak Adventure Equipment really ticks all the boxes when it comes to comfort and functionality. In just 2 size offering the High Back has plenty of adjustment to fit everyone, Simple to put on with an offset front opening to maximise pocket location to easily access with either hand. The High Back PFD is hardwearing yet still very breathable to allow its use on the hottest days. The lifted rear foam allows comfort in your recreational boat or on your Sit on Top kayak. The design is very comfortable and the colours subtle. Yak have a fantastic lineup of quality PFDs with there own sister company Crewsaver the brand leader in gas life jackets they know a thing or two about quality and safety. The NRS C Vest has been a firm favourite for a number of years. 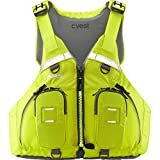 Both comfortable and user friendly the C Vest can be used as a Touring PFD or for fishing its high rear buoyancy is perfect for resting over the top of your seat giving you optimum comfort. For touring comfort, convenience and safety, the cVest can’t be beat. Photographers, naturalists and anyone who likes lots of pockets love it too! Kokatat are well known for their expedition athlete navigating the biggest rivers to the deepest seas so it’s very fitting that their Recreational offering takes a place in our Best PFDs. The Bahia tour is both lightweight yet comfortable the Gaia PVC foam is very soft and low density giving you more flotation for a better fit. The colors are bright probably suited better for recreational kayakers than fisherman but the array of pockets really allows it to be used by anyone, The 3 sizes cover the market well with easy adjustment to get a comfortable fit. Again the Bahia uses a high rear buoyancy design. To best fit over your backrest for a comfortable ride. The Bahia Tour features a high-back with mesh panel to maximize airflow against high back seats. Ideal for kayak fishing, the vest’s multi adjustable side and shoulder straps give a complete custom fit and its various pockets provide plenty of space to stash gear. Made from GAIA® PVC free foam. Astral have been a brand leader in PFDs for a long time from their own resurrection from the old days of Lotus Designs Astral came back to the market with a purpose. To build the best quality, Safest PFDs PERIOD. Once again the V Eight has shown this quality in design and materials. The V Eight weighs just 1.22 lbs making it one of the lightest PFDs , n the market yet still with all the buoyancy you would expect from other brands. The V Eight is the most breathable design available featuring vented mesh and vents throughout the foam to allow for maximum breathability the colours are a good mix of bright and more conservative and the wrap around design is only really seen in this and the Highback from Yak. The V Eight is a great piece for hot environments being low profile and comfortable. 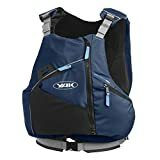 With simple pockets and easy adjustment it’s a really good personal flotation device and a sure favourite for many years. The Keeper PFD from Stohlquist is a more traditional vest-style PFD with foam front and rear. The back of the jacket has a thinner layer of foam to be both comfortable and provide a little insulation against the cold. The Keeper has a really good wrap around design forming well to the body. The pockets are well positioned for easy access with 3m reflection on both front and back to make sure you are seen. The Keeper can be used by both recreational paddlers or ocean paddlers with a really good fitting cinch system the PFD will stay in place no matter what the water throws at you. The Keeper works well as an angling PFD with multiple attachment points and pockets as well as a darker olive colour to suit. 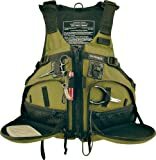 The Keeper PFD still offers a front opening to enable easy donning and removal. The Keeper PFD is constructed with comfort in mind. Extra-wide armholes offer a full range of motion while the low-profile, graded sizing ensures maximum mobility over a wide range of body shapes. Stohlquist’s popular “wrapture” shaped foam contours to the natural shape of the body, providing a secure and comfortable fit without that “restrictive” feeling. The thinner-backed design works well with the higher-backed seats found on many fishing kayaks. The Keeper also features Stohlquist’s innovative Cross-Chest Cinch Harness. This diagonal, front-to-back adjustment – in conjunction with Stohlquist’s graded sizing and wrapture-shaped torso – results in more mobility and a streamlined fit without being tight or restrictive. The “cinch” also keeps the vest down & in place, eliminating chafing on your chin and underarms caused by annoying vest ride-up. The Fisherman PFD from Stohlquist has to be one of the best specific fishing PFDs available on the market packed full of great features it’s a must have for any budding kayak angler. the ingenious use of pockets turning into working areas firstly stops everything falling on the floor but allows good organisation and structure to your layout. Once closed the pockets aesthetically are a good looking design and not obtrusive to paddling or fishing. The high rear foam is well positioned to allow you to sit comfortable against your kayaks backrest, The mesh lower is breathable and fast drying. The Fisherman is only available in the Green color way but for any angler this is perfect, The materials are hard wearing and designed to last. A real favourite for any kayak angler looking for a performance PFD for the biggest catches. With all the PFDs designed for unisex use they sometimes are just not the right shape for women. That’s why Kokatat who build a full line up of Woman’s specialist equipment complement their range with this MsFit Tour PFD. The MsFit Tour is equipped with 3 large pain pockets with a number of smaller options available to organise all of your equipment. This Vest style PFD is suited to recreation and fishing with the buoyancy both front and rear. The MsFit Tour is a front opening design with side adjustment for a tailored fit. The comfortable PVC free Gaia foam is soft and flexible allowing you to move easily and effectively. The front electronics pocket is a great addition with the over the top fastener perfect for either a mobile phone or handheld radio or gps with protruding ariel. In three colourways the MsFit Tour has lots of really good options for women and will also suit men. Front and rear reflective tape, knife garage, strobe lash tab and multiple top-loading pockets gives the gadget-happy paddler plenty of room for gear. Ergonomic and innovative components such as thermoformed, padded Hypalon® shoulders, 3 side adjustments, GAIA® PVC-free foam, and superlative construction methods set the standard in modern PFD design. The Blaze PFD has been the best selling PFD from Yak Adventure Equipment for a long time having a few changes along the way the soft layered foam is extremely light weight. With a single centre zip and clip the PFD is simple to put on and adjust quickly, The adjustable shoulders mean you can get a really good fitment. This is a simple looking PFD and you might wonder how it made it into our list with no frills no big accessories it’s a very standard PFD. BUT it’s a junior sized. When introducing people to paddlesport it’s important everyone wears a PFD this is for everyones safety and a ill fitting PFD can be as dangerous as no PFD. so the Blaze is also built in a smaller size to suit juniors. Allowing them the freedom to get out and enjoy the water. The Blaze is perfect for a range of watersports from Kayaking, to sailing and SUP whatever your adventure this is a great option for kids. So you want to take your infant out to experience the water. Again it is so important to make sure they are protected in the event of a capsize. The Spiral Lifejacket is built for both babies and Infants offering very small sizes with crotch straps to prevent infants falling out of the life jacket. 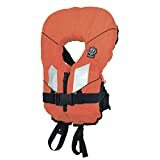 At this age we certainly recommend a lifejacket as they may not be able to swim the large collar of the life jacket will roll them onto their backs to keep the airways open. Crewsaver are one of the market leaders in lifejackets and really understand safety and performance this life jacket is no exception why risk an inferior model with a loved one. A simple zip and clip on the front allows it to be put on easily and the fitted interior vest allows for a secure fit. Bright yellow for visibility with good reflective patches. This is the ideal life jacket for Babies and infants. Crewsaver continues to lead the way in life jacket design and the pioneering children’s lifejacket range is no exception. Crewsaver’s complete range of children’s lifejackets are specifically designed for children, so whether you need something for general in-water play, dinghy sailing or even ocean sailing, there is a Crewsaver to suit. Entry level to the children’s* lifejacket range is the Spiral 100N. The inherently buoyant foam life jacket is perfect for inshore use, including surface watersports and swimming. The 100N of buoyancy reduces fatigue during general in-water activities whilst still providing a fun and comfortable fit. The Crewsaver children’s range now completely outperforms existing products on the market to give your child the safest introduction to life on board. A product that cannot be faulted. Super safe and well fitting for any infant on the water.